The Crossroads @ Firestone, a 53.3k sf, ALDI-grocery-anchored shopping center in South Gate, sold for $29.5 mil ($553/sf). SAFCO Capital Corporation of Los Angeles purchased the asset from Catellus Development Corporation of Oakland. Built in 2017, The Crossroads is located on 5.96 acres at 5802-5840 Firestone Blvd, just east of Garfield Ave and the 710 Fwy. The center is 100% occupied by national and regional credit tenants including ALDI, AT&T, Bank of America, The Buffalo Spot, Burgerim, Churroholic, Fast 5 Express Car Wash, Flame Broiler, Hiccups Restaurants Tea House, Jersey Mike's Subs, La Michoacana Premium, Panera Bread, Pizza Studio, Sherwin-Williams and Tacos El Gavilan. Ed Hanley with Hanley Investment Group Real Estate Advisors represented Catellus in the transaction. David Swartz of LA-based Crosbie Gilner Schiffman Southard & Swanson LLP provided legal counsel for the 1031 exchange buyer. “Assets with sustainable market rents with predictable incremental rent growth long-term are what both institutional and private investors seek in today’s market. Premium pricing will continue to be obtained for neighborhood centers where grocers report top-tier sales,” Hanley commented. 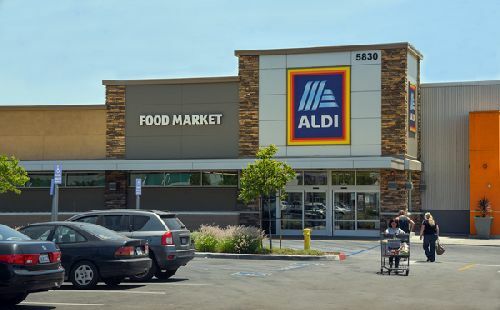 “ALDI’s plan to become the third largest U.S. grocer by store count (behind Walmart and Kroger) by 2022 is further proof ALDI is here to stay in Southern California and continuing to expand north in California,” Hanley noted.